"Eggs, sausage, red bell pepper, and cheese are baked in hash brown potato 'cups' for a delicious breakfast that will feed a crowd." Prepare sausage according to package directions. cool slightly and cut into 1/2-inch pieces; set aside. In a bowl, combine hash browns, butter, salt and pepper; divide evenly into 12 greased muffin cups. Press mixture onto sides and bottom of muffin cups. Bake at 400 degrees F for 12 minutes or until lightly browned. Remove from oven; divide sausage pieces into muffin cups. In a bowl, combine eggs, cheese and bell pepper. Spoon mixture evenly into muffin cups. Sprinkle with chives or onion. Return to oven, bake 13-15 minutes or until set. Serve. 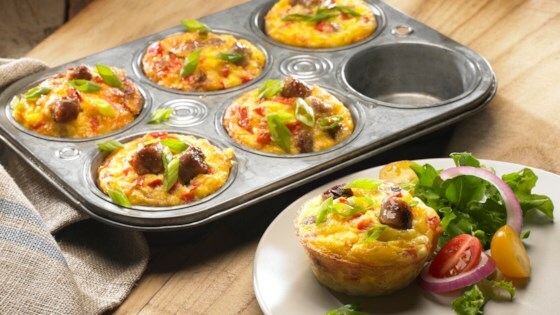 See how to make Amazing Muffin Cups with eggs, sausage, cheese, and hash browns. Option: This recipe can be doubled to make Jumbo Breakfast Muffin Cups. Press hash brown mixture into 12 greased jumbo non-stick muffin cups. Bake crust for 12 minutes. Fill cups and bake 22-24 minutes longer or until set. The hashbrowns didn't crisp for me but the finished product did come out for the most part(I lost 2 due to them falling apart). Overall, not very impressed.